3 Bedroom Detached House For Sale in Dorking for Guide Price £1,000,000. A truly charming Grade II listed 16th century detached period cottage of immense character with later extension set in a beautifully landscaped garden which features a small stream at the furthest end set in the sought-after hamlet of Sutton Abinger. This is located in an area of outstanding natural beauty in the Surrey Hills betwixt Abinger Hammer and Holmbury St Mary. The cottage has timber framed elevations under a recently replaced clay tiled roof, and the extremely well presented accommodation has many character features including inglenook fireplaces, antique latched doors and a wealth of exposed beams both on the ground and first floors. Internally the accommodation is generous with two superb reception rooms leading off the entrance hall on the ground floor together with a bespoke kitchen/breakfast room. The first floor is accessed via two staircases and configured with a spacious main suite together with two further double bedrooms served by a family shower room. Outside there is a detached garage with open car barn to one side and parking area. There is a further storage shed. The gardens are a lovely feature of the property being well stocked with various flowers and shrubs and surround to all sides with a large expanse of lawn and stone terrace. 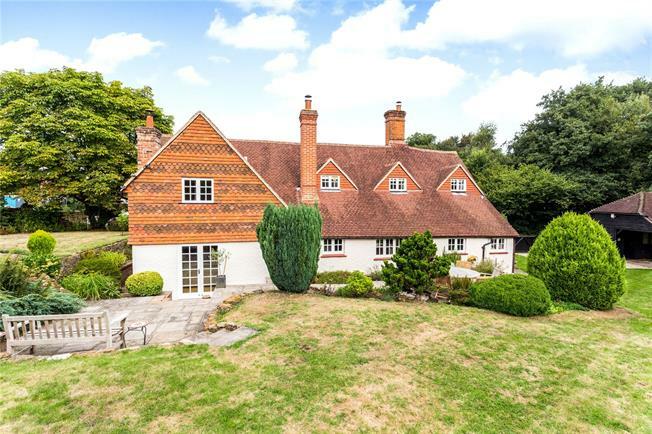 The cottage enjoys an enviable location along a country lane in the heart of the Surrey Hills, a designated Area of Outstanding Natural Beauty. Local beauty spots nearby include Leith Hill and Holmbury Hill, with impressive wealden views as far as the south coast, Newlands Corner, Box Hill and the Denbies vineyard. There is also the atmospheric Silent Pool at Albury, the tucked away Stephen Langton public house beside the lake at Friday Street and the nearby Volunteer. The village shop and farm shop at Abinger Hammer are convenient for daily needs, whilst Cranleigh, Dorking and Guildford provide between them a comprehensive range of shopping, leisure and cultural amenities. The A25 at Abinger provides a direct link to the A3 and A24 for London and the south coast and the M25 for access to the airport and the national motorway network. There are main line stations at Guildford and Dorking offering fast and frequent services into London, with journey times from around 40 minutes. The local train at Gomshall, on the Guildford and Reading line, also provides a link to Gatwick airport. There is an excellent choice of good schools in the area, including Shere Primary, Duke of Kent, Hurtwood House, St Teresa's, Cranmore and Cranleigh School. Recreational opportunities in the locality include golf at several local clubs, polo at Ewhurst, country sports at several local venues and superb walking and riding in the surrounding countryside.